All our Tiles are fired in a kiln. Set of 10 tiles tiles measure 150mm x150mm and will fit Victorian Fireplaces. We screen print the image. Using ceramic colours and not inks , then it's applied to the tile and fired in the kiln which melts the glaze and makes the image permanent the image will not fade. We have over 15 years experience of supplying museum shops , historic sites and interior designers. We have won awards from the Tile Association. For the design and quality of our tiles, we can also work to commission. Our ceramic studio is based in South East London and we accept visits by appointment. We can also fire on to any blank tiles of your choice, and offer advice. 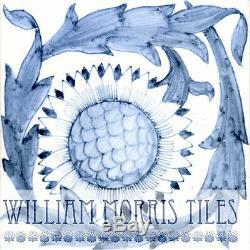 The item "Arts And Crafts William Morris Sunflower Tile Kelmscott Manor Fireplace Tiles" is in sale since Thursday, December 6, 2018. This item is in the category "Antiques\Architectural Antiques\Tiles". The seller is "nina3209" and is located in London. This item can be shipped to United Kingdom.